People in the Red River Settlement around the time that Manitoba became a province are, for many of us, merely names in history books. Seeing their faces personalizes them, makes them somehow more real and the events they witnessed more immediate. Their photographs were taken during visits to the East or the “Old Country”. Starting in the 1860s, however, it became possible to have one’s picture taken at home, as several photographers began operating in Rupert’s Land. 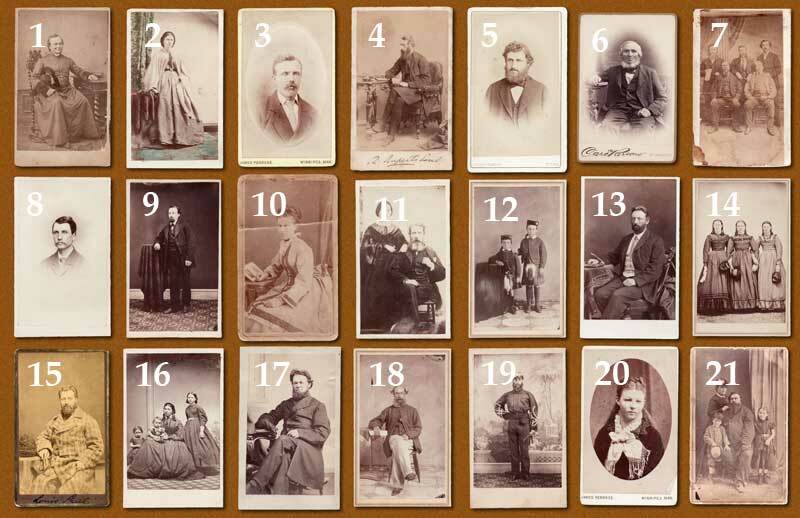 A sampling of the small Carte-de-Visite photographs popular in the period are reproduced on the covers of this issue. How many do you recognize? A. Private collection, L. G. Goldsborough. B.	Mrs. John Black Fond C44/2, Archives of Manitoba. C.	Elizabeth Green Fond C44/5, Archives of Manitoba. D.	Harriet Inkster McMurray Fond C44/1, Archives of Manitoba. E.	Polson Family Fond, Archives of Manitoba. F.	Private collection, D. Dudgeon. G.	Louis Riel photograph collection PC107, University of Manitoba Archives & Special Collections.